Awesome job FFD!!!!! 32 seconds pulling a 77,000 pound ladder truck. First place now!!! FRAMINGHAM – On a rainy Saturday morning, members of the Framingham Police Department and members of the Framingham Fire Department spent time trying to pull a fire truck. Both public safety organizations sent teams to the 7th Annual Hero’s Haul is a fundraiser for Special Olympics Massachusetts, organized by the Law Enforcement Torch Run program umbrella. The goal is to have your team pull a fire truck 20 feet in the fastest time. 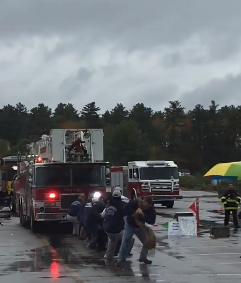 The Framingham Fire Department team won the event, pulling the truck the fastest in 32 seconds. The winning team members include: Team captain Tyler Easson Steve Jones, Lt. Kevin McDonald, Lt. Greg Benitich, Adam Quitt, Ramiro Mendonca, Scott Young, Keith Rovinelli, Michael Campion, Tim Campion, Lt. Joel Sexton, and Chad Sexton. The pull was Saturday, October 13, from 10 a.m. to noon at the Xfinity Center in Mansfield, followed by a post-party featuring a DJ, food, and activities. The the Law Enforcement Torch Run program is an international fundraising and awareness building program that had more than 1,000 members of Massachusetts Law Enforcement raise more than $500,000 in 2015. Internationally, more than 85,000 officers raised $50 million for their local Special Olympics chapter.